According to the Environmental Protection Agency, the top five air quality problems in the U.S. are all indoor air problems. Common residential indoor pollutants include excessive moisture, volatile organic compounds (VOCs), combustion products, radon, pesticides, dust particles, viruses, and bacteria. All of these are known to affect human health, and the resulting odors, dampness, stale air, and stuffiness also make a house less comfortable. Most control strategies help with both gases and “particulates” like dust, pollen, and smoke particles. However, while filters of increasing sophistication can trap most nuisance and harmful particulates, there really aren’t comparable removal strategies for gases. In some cases, activated charcoal and similar substances have been employed for this purpose. Moisture is one of the most important and least recognized indoor pollutants, affecting both human health and the health of the building. The most common moisture problems arise when warm moist air encounters a cool surface such as a mirror, window, or the wall of a cooler space. Cooler air can hold less moisture, so the excess condenses in droplets on the surface. Where moisture collects, so do mold, mildew, and dust mites, which can cause asthma or allergies, destroy wood products, and accelerate the rusting of metal building components. High indoor humidity can also facilitate “off-gassing” of toxins in furniture or cleaning products. Moisture affects comfort too: too much moisture in the cooling season creates a “cold-clammy” feeling inside. Too little moisture, which is common when it is very cold outside, can also be unhealthy and uncomfortable. Water can be transported into a house as liquid, by driving rain or basement leaks; as vapor in humid air; or through capillary action—that is, the movement of moisture upward from the ground through porous materials like wood and concrete. Moisture also originates inside, from bath and kitchen activities, plants, and unvented gas appliances. Radon is a radioactive gas that is generated naturally in the soil and enters the house from the ground. Radon is the second leading cause of lung cancer in the U.S. Its concentration in buildings varies regionally and even locally. There are excellent and relatively inexpensive ways to control radon concentrations where the levels are elevated. These generally involve using a small fan connected to a PVC pipe system to reduce the pressure of the soil gas and vent the radon-rich air harmlessly into the atmosphere so that it doesn’t enter the house. The system pulls air from beneath the foundation slab and generally exhausts harmlessly to the atmosphere at roof level. Gas-fired appliances, including furnaces, water heaters, ranges, and some dryers, produce carbon dioxide, carbon monoxide, nitrous oxides, and water vapor. If the appliance is not vented properly to the outside, or if the air pressure around a non-sealed gas appliance is negative enough to cause backdrafting, combustion pollutants can enter the house. 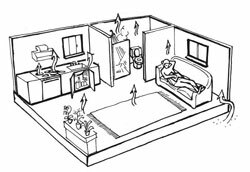 Carbon monoxide (CO) is a particular concern because it is a colorless, odorless, toxic gas that is difficult to detect without a well-designed CO detector, and can be fatal. Likely sources of CO include unvented gas heaters, worn or poorly adjusted gas appliances and equipment, and improperly sized or damaged flues to furnaces or boilers. Auto, truck, or bus exhaust from attached garages, nearby roads, or parking areas can also be a source. Learn more about the risk of CO at the EPA website. VOCs include a range of evaporated substances, including formaldehyde, which can be emitted by building materials and furnishings (such as furniture and carpets), gasoline from the garage, pesticides, and even cooking processes (the great scent of bread baking and the pungent smell of frying onions). VOCs include body odors, too. Many of these are just nuisances, but some, like formaldehyde, threaten health, sometimes at concentrations too low to be sensed. Smoking is in a class by itself because its health consequences (even for non-smokers) are so well-documented and because it produces copious amounts of both harmful gases and particles. From both an indoor air quality and health perspective, few activities rival smoking in detrimental effects. There are many potential sources of indoor air pollutants such as volatile organic compounds from rugs or potted plants, randon from the soil, repsiration from people breathing, moisture from bathrooms, or combustion products from the kitchen. To learn whether radon is a concern in your area, or to test for elevated levels in your house, click the button and search for "radon."